Rome: Curse of the Necklace ™ is rated 4.0 out of 5 by 10. Rated 5 out of 5 by colorsplash from Still my favorite Never reviewed this. Have been playing and replaying for years. still all 360 games are in top 10 hidden object games. Rated 5 out of 5 by Nannykc from Loved them!! I wish they would make more of these... my husband and I both loved them and have played them over and over!!! 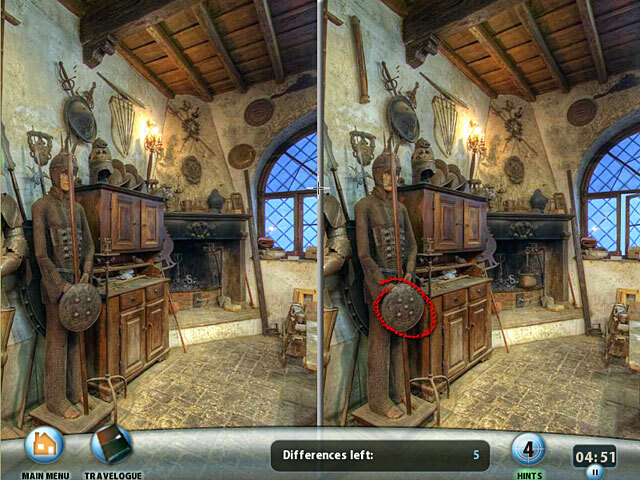 So clever for the hidden objects to be able to see 360 degrees to find the objects made it really fun and a great challenge. I loved the locations and seeing places that I probably will never go to... try them out... even though they are kind of old... you won't be sorry and they just don't get old!!!! Rated 5 out of 5 by GamerCouple from Stunning visuals and interesting 360-degree gameplay This hidden-object game stands out from the rest because it uses a very innovative technique of 360-degree searching. Players stand in the middle of the scene and can turn the view to look up, down, and all around--and zoom in and out if need be--to find objects, some of which will be "hints" that advance the storyline. In this manner players jet all around Rome and its surrounding countryside to figure out a mystery. I absolutely loved this game. The scenes were immersive and downright fascinating, and I learned quite a bit about Roman history and culture while playing. (I found myself dragging out my big Italian-English dictionary to look up some of the words and phrases I ran across in the scenes!) I found myself wishing for even more scenes or even for just the ability to wander around and look at stuff with that 360-degree camera. The storyline is decent, with a strange supernatural twist that I didn't think was really necessary. The mechanics of the hidden objects were fine, though sometimes an object was painted/photographed in a vague, indistinct way that made finding it more difficult than it had to be. The zoom feature helped a lot with that problem. The game features some minigames that weren't especially difficult, like piecing together postcards and playing card games. I do wish the hidden-object screens themselves didn't have such a junkpile theme; the developers could have handled them so much better, and this game deserved more thematic screens. But overall it all works well. I've played this game through a few times and it seems like I enjoy it more every time I play it. Rated 5 out of 5 by gamefan10 from This is an excellent game! The name of this game is kind of confusing. 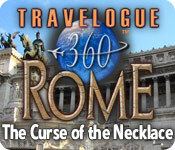 It should be "Travelogue 360: Rome - The Curse of the Necklace". Other than that, it's perfect! Here's the story line: 200 years ago a noble family disappeared. You play the game to find out what happened. You find clues in every chapter, each one explaining part of the mystery. It's lots of fun to look around 360 degrees - overhead, under your feet, and all around the room - looking for hidden objects. Most, but not all, of the objects are clear and large enough to see. Some of the names of the objects are a little obscure. But there's a good hint button for those few objects that are a little too small or far away or obscurely named. I used a systematic search approach, looking around the room using the rotating ball. Then I did the same thing again, only this time using the zoom at the largest setting. As you explore and solve each chapter, you learn fun facts about some of the old traditional businesses in Rome. You do visit each scene more than once, but that helps because you remember where some of the objects are when you saw them the first time. I totally enjoyed this game and highly recommend it. Rated 5 out of 5 by scoonerz from The Best There is!! The Travelogue series are undoubtedly the best there is. I can't understand why there isn't higher reviews! It is unlike any other HO game you will ever play! It plays in exactly what it says 360 views and what beautiful views they are! 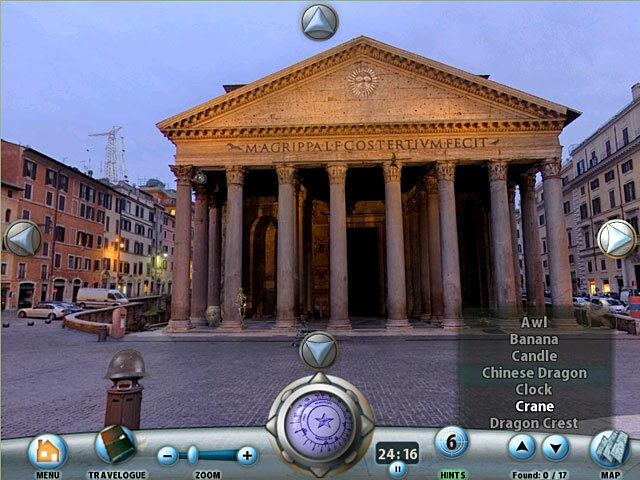 If you have not tried Travelogue 360 hidden object games (Paris and Rome), you are seriously missing something! Please give it a try and don't forget to leave a review because I think they should seriously consider creating another 360 HO game! Rated 5 out of 5 by dcsouth from Excellent I would love to see more Hide & Seek games like this. I thought the 360 views were a great idea. Makes the seeking much more difficult. Way better than "single view". Please give me more more more!!! 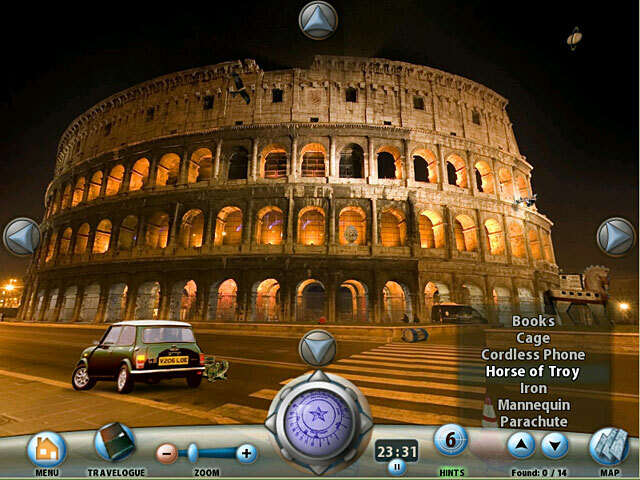 Rated 3 out of 5 by charlene_lane from ROAMING AROUND ROME I remember years ago playing the London game many times and thought I would buy Rome and Paris as well. There are no voiceovers in this game but there is plenty of chatter and noise in the background - almost like being there really. Now, playing these Travelogue 360 games are very different to playing your normal HOS games. You have a ball at the bottom of the screen which can move in any direction. You also have a zoom in and out function as well to get closer to objects. I enjoyed playing with these. The hidden objects are extremely cluttered and hard to find. Remember to check everywhere - all around the floor, on the ceiling and, if you are outside, check the sky and ground. You just never know where objects are going to be. Graphics are not that great and, because scenes can be very cluttered, especially inside shops, etc, items can be quite blurry and hard to see. I would really love to see these games updated by the developer. I reckon then that these games would become very popular. I think the London game came out about 2007. They are challenging, fun and so educational. It seems such a waste to not update these games to the latest graphics because the developer had something so unique. Sound and music are excellent. I liked all the background chatter and noise and the music was very apt for the game. The game took me a while to complete - about 5 hours I think. I decided to just play on Tourist which has no time limit so I could have a good look around. Next time I play I will play on Explorer which does have a time limit. I definitely recommend this game because there is something very special about it - and London and Paris as well. If you can get passed the graphics, then you will definitely enjoy yourself. Happy playing. Rated 3 out of 5 by star66clamart from a real snoozefest Although the visuals are stunning, you have about 6 settings where you search for tiny objects while you search in a 360 degree arc. The objects are often the same as are the settings. It becomes tedious and boring very quickly. Rated 2 out of 5 by jasminejc7 from SEARCH FOR ANOTHER GAME It was interesting at first. Then it became tedious and boring. Too repetitive, searching for objects that were not easily visible, had to use the arrows often for guidance. Rated 2 out of 5 by taramci from 360 view gets old fast The idea of a 360 degree HOG was fun at first, but got old after the first few levels. Many scenes are repeated.